I’m so excited to introduce you to essential oils and show you how you can get started with them. Many people come to me seeking safer products within the home, they are tired of using synthetics, and they are curious and looking for more simple and effective homemade solutions. I’m sure you can relate! 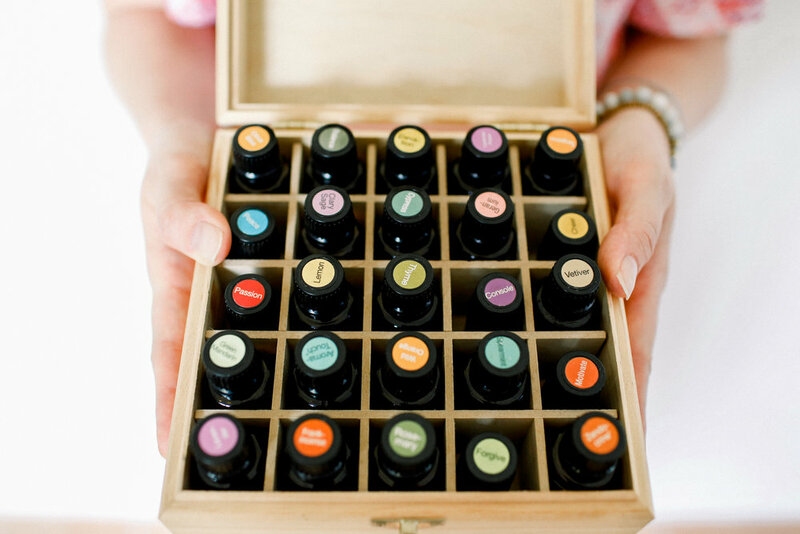 for anything now that we have essential oils in our home. I’m often heard saying “I’ve got an oil for that!”. I never leave home without a selection of my favourite oils and use them on a daily basis for so many things, including looking after my family. I know I said it above but I am so excited you are here because I know that you are passionate about finding a more natural approach to your health, self-care and wellness. I just know that you will fall in love with doTERRA's certified pure therapeutic grade essential oils. If you want to learn more about the opportunity to build a business with residual income as part of my team, click here for more info. If you have been following The Essential Society for a little while now and you already know what you are looking for, click here to get started. If you are not yet ready to purchase but want to learn more about essential oils, grab a cuppa and read on. But what exactly is a volatile aromatic compound? In short, these compounds are small organic molecules that tend to change quickly from their solid or liquid state to a gas at room temperature. They are called volatile because they change state quickly. When you first open a bottle of essential oil, you instantly notice that the aroma is potent and you can smell it typically even from some distance. AROMATICALLY - by inhaling directly from the bottle, rubbing a drop of oil in the palm of your hands and inhaling, placing a drop on a shirt collar or pillow, mixing oils in a spray bottle with water to mist over furniture, carpet or linens, using in home-made cleaning products or diffusing in a diffuser. TOPICALLY - by applying to the affected area of the bottoms of your feet - perfect for spot-treating discomfort or irritated skin, immune support and providing systematic effects. INTERNALLY - by ingesting oil in capsules (doing ti this way bypasses the mucous membranes). Certain oils have a rich culinary history and can be used as dietary supplements supporting a variety of health conditions. Why did I choose doTERRA essential oils? As a new user of essential oils, I wondered what the difference was between different brands. There are many brands on the market and they all differ in price. After trying a few oils and before ordering the home essentials kit for use by my family and I; I did a lot of research into doTERRA to find out more about them and the products. I wanted to know more about how they are sourced and tested before using them with my family. I was extremely impressed by doTERRA’s process for sourcing and testing the oils. After learning more I learnt that it isn’t always about the testing; you have to look at the whole process including sourcing. I believe doTERRA’s process is better than the others I researched and feel that they are the leaders in this industry because of the lengths they go to, to get the best quality oil in the world. doTERRA’s commitment to quality starts way before the plants are even distilled through co-impact sourcing which is explained in this video. doTERRA’s CPTG Certified Pure Therapeutic Grade quality protocol employs five different analytical methods to ensure their oils are both pure (extracts contain only the volatile aromatic compounds of a plant) and potent (extracts have consistent chemical composition from batch to batch). The CPTG standard has been set by doTERRA as there is no standard in place for the industry. The FDA only regulates that therapeutic grade oil has to include 70% pure oil only. doTERRA also do skin irritation testing to make sure that when it is applied topically it does not irritate the skin – this was super important to me as I have sensitive skin and I wanted to not only use the oils topically on my skin but also on my children. I believe that doTERRA sets the bar for quality, purity, efficacy and consistency and decided that this was the best brand to use in our home and with my family. Perfect for adding your favourite essential oils to the lava beads to allow you to enjoy your oils all day long. Below you’ll find the full details on why this monthly order program (LRP) is the best program on earth for receiving free stuff and rocking a healthy lifestyle! Completely optional and you have the ability to cancel at any time. doTERRA's loyalty program rewards you for ongoing loyalty when you make regular monthly purchases. Basically doTERRA rewards you for living a healthier life #amazing. The program allows you to earn product credits that can be used towards purchases of doTERRA products. By far the best option for purchasing doTERRA oils is to buy an enrolment kit, which includes your wholesale membership and gives you the opportunity to buy future products at wholesale prices. View the enrolment kits here. You also have the option to receive commission/referral bonuses for sharing with friends and family – or building your own business, should you choose to – feel free to talk to me about the share program. Access to our growing facebook group for support, guidance and as a place to share how you are using the oils and ask any questions you have. A copy of my e-book, ‘I’ve got my oils… now what?’ to help you in the early stages of using the oils. It also includes an a-z guide of what you can use the oils for. Access to other amazing resources from our team of doTERRA wellness advocates. What if I don’t want to buy an enrolment kit? If you don’t want to purchase an enrolment kit, you can pay the enrolment fee of $35 and then add in the oils you would like below in the ‘cart’ section by typing in the name or the product code of the oil. Step 1: Click over to ‪http://mydoterra.com/sarahpoppy and click on 'Join & Save' at the top then enter your country and hit continue. Step 4: Select your starter kit. This is where you can specify which enrollment kit you would like -OR- if you’d rather not start with a kit, simply select the Introductory Packet ($35) option (this is your wholesale membership) and add in the oils you would like below in the “cart” section by typing in the name of the oil. Step 6: When a little box pops up asking if you want to set up your LRP, I'd recommend saying yes and setting up your order to ship between the 1st-15th of the following month so you start earning points for free products immediately. You can set up your next month's order over 50PV (100PV if you want to earn commission and share the oils) but you don't have to pay for this order until it ships on the date you choose for the following month. Step 7: EMAIL ME - sarah@sarahpoppy.com - Tell me you purchased a starter kit through me and which one you chose! This way I can connect with you and share any additional information and add you to our High Vibe Facebook community. You can order from anywhere in the world! I can guide you in setting up your own wholesale account from where you are – send me an email (sarah @ sarahpoppy . com) and I will send you all the information you need. WANT TO SUPPLEMENT YOUR INCOME OR MULTIPLY YOUR INCOME WITH AN ESSENTIAL OILS BUSINESS?